A beautiful bride once mentioned that she spent six months looking for her shoes and that was a moment when I realized the importance of photographing properly the wedding details. This Chateau Le Parc special event offered plenty of opportunities to show my expertise in capturing not only the moments of the big day but also the beauty of the little things on which the bride and groom spent plenty of money. 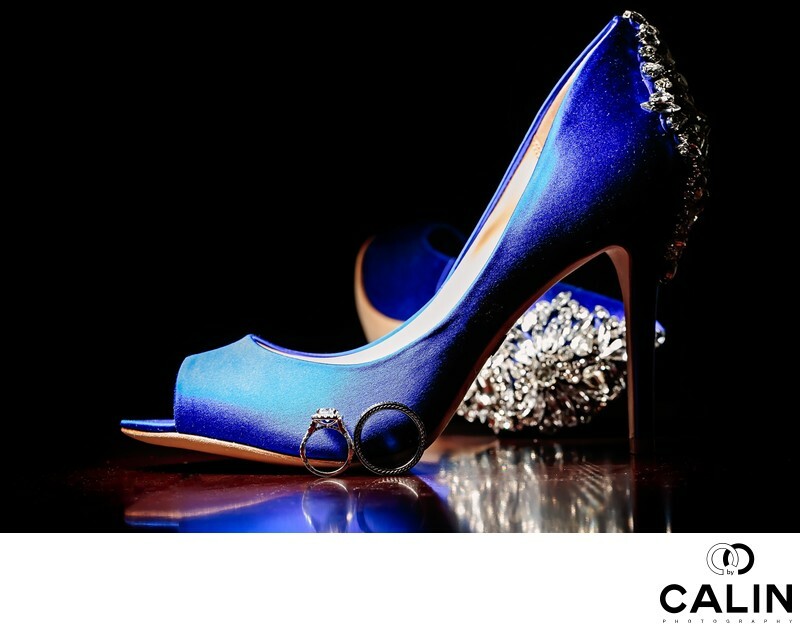 This image occupies a full double spread on the wedding album and features the bride's engagement and wedding ring leaning against her shoes. This is one of my signature shots that I love taking during the bride preparation for the wedding ceremony. The way I created this image was by placing a large light source above the shoes and rings. With that makes this image special is not only the interesting concept, but also the beautiful reflection in the subject isolation. By shooting at F11, I was able to darken the distracting background and only illuminate the shoes and rings so the stand out in the frame. The shoes creates a leading line directing the viewer's attention towards the rings. In post processing, eye colour corrected the image, then sharpened it, enhanced the reflection by adjusting the levels and curves and finally I applied a selective vignette to draw the viewer's attention to the subject of this photograph. While post processing is not crucial in the good photographer is able to create splendid images in camera, I often find that in post production, one is able to take a good picture and make it great. Please go through the whole gallery or view the video below to see some other photographs of the venue and other details.